Last Updated March 30th 2019 Your kitchen is where you spend a lot of time in the home cooking, cleaning and even just hanging around, It see’s a lot of use. No place sees more use than the kitchen sink and in fact around 60% of your time in the kitchen is spent in front of it. The Kitchen faucet is a key element of your kitchen and with the amount of use it’s getting you’ll need to make sure you have one that’s up to the task. In this Moen vs Delta Faucets reviews guide you will learn which is the best faucet brand company for your kitchen. There’s been a lot of change with kitchen faucets in the past few years. Style has become a lot more important with new models being made to challenge what we’ve been used to traditionally. With these style changes there’s also been a demand for consistent performance and improved features. More utility needs to be included in our kitchen faucets so we can make the most of the whole sink. If you are interested in a new kitchen sink, check out our reviews on Composite Granite Sinks or Acrylic Kitchen Sinks. 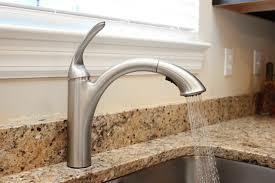 There are a lot of places both online and offline where you can find a good kitchen faucet. It’s a really saturated market place but for the best value and best products you sometimes have to do a bit of deeper research. Moen and Delta are both well known names in the kitchen industry and both specialise in kitchen faucets. There are ongoing debates across forums regarding which is better and people’s opinions are well and truly split. Let’s take a closer look at both of these brands and see what they have to offer. Moen’s story begins in 1937 where their founder, Al Moen, set out to design a better water delivery system. From there they went on to start manufacturing kitchen faucets, making improvements and adjustments year on year. In their 80 year history they’ve overcome some incredible challenges and even thrived under difficult conditions. Behind Moen is a drive for perfection and to offer their customers more. 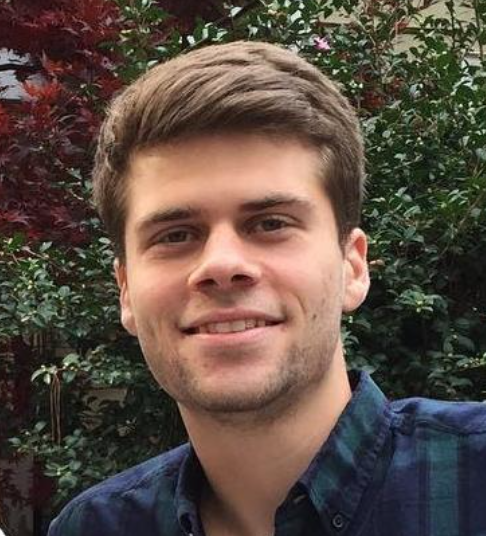 Their goal is to offer great value to everyone by incorporating innovation into their products. As a company they have always shown a willingness to look forward and it’s clear by their range of products. Nowadays Moen have a varied product selection that has diversified as the company has grown. They’ve been responsible for helping advance the industry and have been instrumental in developing some of the more useful kitchen faucets. 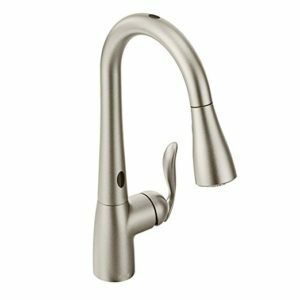 Out of all the Moen kitchen faucets I’ve used over the past few years, my favorite has been the Moen Arbor MotionSense Kitchen Faucet. 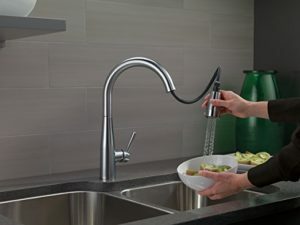 This Moen kitchen faucet is one of the most advanced on the market place today! With two sensors with one on the top and one near the base, allows an easily accessible touches design. All it takes to turn this faucet on is a simple hand movement to initiate the water. Not only does the Arbor MotionSense features touch-less functionality, it also features a Power Clean mode which allows the faucet to spray at 50% more power to help remove tough to remove stains and smudges. Along with this, this faucet features the hose design that Moen is known for! It features the made to fit faucet head that easily extends out into the faucet hose. 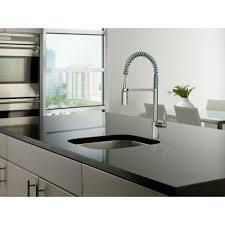 Overall this Moen Arbor MotionSense kitchen faucet is the best Moen faucet available on the market toady. It features touch-less design that makes it extremely easy to use without have to touch the faucet if you’re hands are dirty, and it also features multi-functionality that helps to clean and wash things like never before! Delta is in some ways the complete opposite. They’re a completely fresh company and while they don’t have the long history they have come in with a fresh approach and some innovative ideas. Delta are motivated by three things; water has the power to transform the way people feel every day, there can be magic in simple solutions and innovations flow from human insight. They have molded their company around the needs of their customers and have been striving to give more throughout their history. Delta too have expanded their product selection and diversified. During this time they haven’t lost any of their quality and they are regarded as one of the best kitchen faucet providers around. 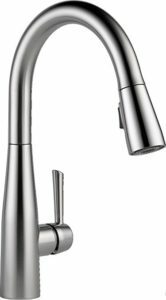 Now that we’ve talked about my favorite Moen kitchen faucet, it’s time to talk about my favorite Delta kitchen faucet which is the Delta 9113-AR Kitchen Faucet! This faucet is an absolute beautiful looking faucet that offers great functionality in an extremely sleek design. This is a single headed faucet that features pull down technology for an easy clean. Along with that, this sink is featured in four different finishes, Chrome, Arctic Stainless, Matte Black, and Venetian Bronze, and it also comes in both the standard touch design and an innovative touch-less design. That being said, this faucet features a brand new rubber hole design in the head that helps to reduce mineral build up, and an extremely helpful magnetic design to snap the head back into place. Also it features two distinctive spray methods, one called the Spray is useful to cover a larger area, and help to wash away light mess, and the other is the Stream which is useful to remove harder to remove stains. 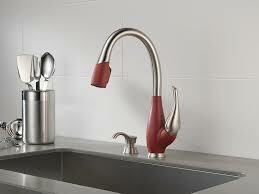 Overall this is a great looking and functioning kitchen faucet. This is a great faucet for both people who are looking for a simple but sleek looking faucet with the standard Touch Design, or for those who are looking for a Touch-Less Design. Now that we have talked about kitchen faucets, it’s time to start talking about some bathroom faucets from both companies. Both of these companies offer some great bathroom faucets, and they come in all sorts of styles and materials, so there definitely will be something for your bathroom! As mentioned above, Moen has been around for quite a few years and they really have made a name for themselves with their bathroom faucets. Moen really focuses on the quality of their products, and this translates into beautifully made products that really can upgrade the look of your bathroom! Over the past few years of testing a few different Moen Bathroom faucets, I’ve found my favorite. My favorite Moen bathroom faucet is definitely the Moen Brantford Two Arc Center-Set Bathroom Faucet! This is a beautiful faucet that comes in three different styles: brushed nickel, chrome, and oil-rubbed bronze. This faucet is a centered faucet that features dual temperature controls, obviously one hot, and one cold. Just a note this faucet doesn’t include the valve, so you will need to purchase a valve, or find out if your current valve is compatible. Along with that this faucet features a 3 hole mount with a 4 inch center-set design to make installation as easy as possible. Although this faucet is one of my personal favorites, it isn’t necessarily flashy and technologically advanced. 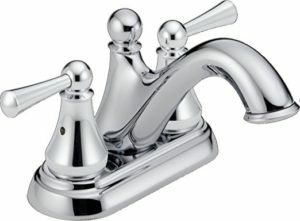 Now don’t get me wrong, this faucet is extremely water efficient and meets WaterSense standards, but it doesn’t have touch-less activation, it doesn’t connect to your home’s wifi, it doesn’t check your blood pressure… But that’s the beauty of this faucet, it is a stunning classic faucet that will always look great and stay in style. It does what it’s supposed to do brilliantly! This intricate and polished looking bathroom faucet will look great in nearly any bathroom in your home! Delivers 1.2 Gallons Per Minute of Water. 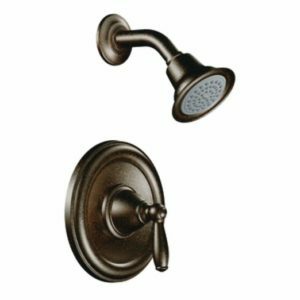 Comes in Brushed Nickel, Chrome and Oil-Rubbed Bronze Finishes. 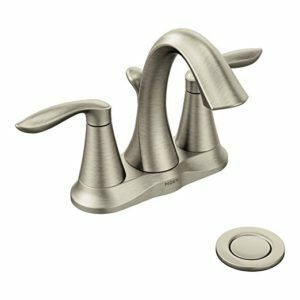 Overall this Moen bathroom faucet is one that not only looks great, but it also is anything you should want in a bathroom faucet. It looks great, it is water efficient, it is durable, and it has a lifetime warranty. This is the type of bathroom faucet that will last you tens of years, and it will continue to look great doing it! Moen produces products for the kitchen and bathroom. They design everything from sinks to showers but at the heart of their company is the kitchen faucet. They have hundreds of different varieties available which are separated into styles: traditional, transitional and modern, this choice will be determined by your existing furnishings. There are countless different variations of style offered by Moen and the selection is vast. 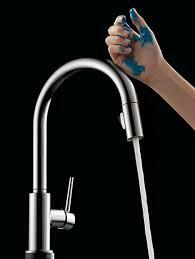 They offer 4 different styles of finish on your faucet to help adapt the colouring and protect the piece. These are: Bronze, Matte Black, Spot Resist Stainless and Chrome. The majority of Moen’s faucets are metal and the whole collection has a modern feel. That doesn’t mean there’s nothing for more traditional homes but it definitely isn’t the focal point. Delta have a fairly similar selection at face value but their collection does have a different feel to it. There are definitely more striking styles on offer with colouring that appeals to the eye. Again they offer kitchen faucets for modern, traditional or transitional homes and once again the focus seems to be on modern convenience. Delta have a greater cross section of products and make products for the kitchen and bathroom. They subdivide their faucets into various collections which makes it easier for those with certain budgets to know where to look. With Delta’s collection more heed is paid to the features of each faucet and it’s very apparent what each of their models has to benefit the user. There is definitely more choice available with Delta and more variety of different features. Both these brands have a really wide selection of well created and useful products. The design and style choices along with finishes allow you to keep the design process in your hands. Both of these collections have enough products that you’d certainly be able to find at least a few that fit your style. Moen’s quality is well known and the company pride themselves on creating good quality, reliable faucets amongst other things. 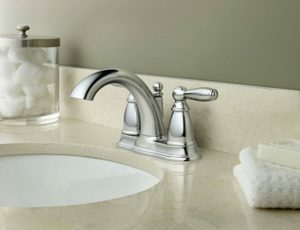 Moen apply their unique LifeShine finish to their products to help protect the faucets from any corrosion, rust or tarnishing. They incorporate a hydrolock connection system to each of their faucets for faster installation. One of their main focuses is on providing quality to the customer through these innovations and always making sure they get the best. Delta as a company pride themselves on innovation and this can be seen in all of their products. Over their history they’ve improved upon their products and are now using some of the best metals around to ensure the quality of their products. Delta uses Brilliance finishes on their products to help maintain them for longer. These finishes help protect the faucet from potential staining, tarring or corrosion, giving them a longer life span. Both Moen and Delta have designed similar products that show how advanced they are. Touch activated hand showers, toilet seat night lights, touch clean faucets and energy efficient solutions can all be seen in both their product ranges, showing their intelligent design qualities. Moen and Delta are both great quality faucet providers but the edge has to go to Delta. They have more consistent positive feedback from customers and their products are all built to last a long time even under considerable wear and tear. 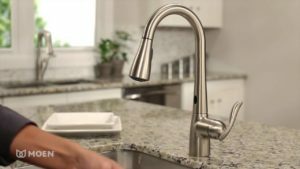 Moen and Delta are both described as top brands for kitchen faucets and it’s clear to see why it’s difficult to choose between them. The companies have a lot of similarities, including their passion to create great kitchen faucets. Both companies value innovation, style and quality and have built their product ranges to reflect this. 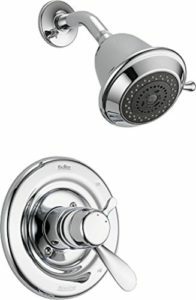 While Delta boasts more products and more durable products, Moen has a wider range of technologically advanced products. Overall the companies really are both impressive. 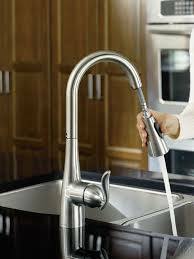 If you’re looking for a good, reliable kitchen faucet then you can’t really go wrong with either. They’re similarly priced so let availability be your deciding factor and go for the style you like the most. Both of these companies know their craft and you won’t be disappointed. If you are interested in other kitchen product reviews click here!